Using the purest organic bioactive Aloe Vera ensures that the plant’s beneficial polysaccharide levels are maximised to help soothe, moisturise and restore dry and sun exposed skin. Our bioactive organic Aloe Vera lotion instantly soothes the skin, leaving it feeling healthy, soft and bursting with cell restoring activity. Aloe barbadensis leaf juice, Aqua, Caprylic/Capric triglyceride, Polyglyceryl-3 methylglucose distearate, Glycerin, Isocetyl palmitate, Cetearyl alcohol, Myristyl myristate, Olea europaea (Olive) oil unsaponifiables, Theobroma cacao (Cocoa) butter, Butyrospermum parkii (Shea butter), Glyceryl caprylate, Tocopherol, Helianthus annuus (Sunflower) seed oil, Glycyrrhetinic acid, Retinyl palmitate, Xanthan gum, Chondrus crispus (Carrageenan) extract, Parfum, Sodium benzoate, Potassium sorbate, Sodium phytate, Citral, Limonene. 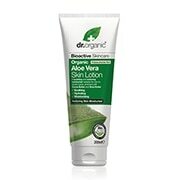 Dr Organic Aloe Vera Skin Lotion is rated 4.8 out of 5 by 65.